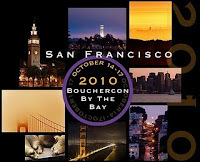 As I discussed yesterday, the 2010 Bouchercon festival is about to kick off in San Francisco - four days of fantastic author events and crime fiction festivities. At Bouchercon by the Bay, the winners of three major crime fiction awards will be announced; the Thursday night Opening Ceremonies will include the presentation of the Barry (run by Deadly Pleasures magazine) and Macavity (run by Mystery Readers International) Awards, followed by a festive reception. And of course later in the weekend the winners of the festival's own long-running awards will also be announced; the Anthony Awards (I understand the winners are based on the votes of attendees at the convention itself). I thought it might be interesting to take a look at some of the finalists for the three different awards, and see what sort of repetition and crossover there was between the books on each of the three lists. 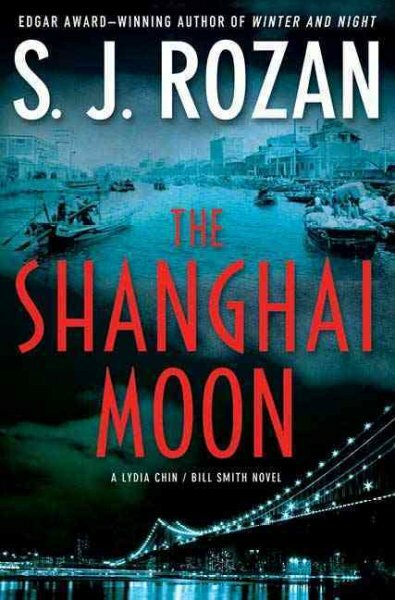 As you'd expect, some crime novels appear on more than one list - but when it comes to the major Best Novel award, there is one novel that is on all three finalists lists; THE SHANGHAI MOON by SJ Rozan. So, win or lose, walking away from Bouchercon with three awards or none, you could say that SJ Rozan at least has the honour and distinction of being the 'consensus finalist' of each of the three judging panels. Quite an achievement in an awards world that often throws up some pretty interesting results. Rozan is an author I had heard of, and I've read some of her short stories in a couple of crime fiction anthologies, but never any of her novels (yet). I might have to try to get my hands on THE SHANGHAI MOON however, and see what the fuss is about. Estranged for months from fellow P.I. Bill Smith, Chinese-American private investigator Lydia Chin is brought in by colleague and former mentor Joel Pilarsky to help with a case that crosses continents, cultures, and decades. In Shanghai, excavation has unearthed a cache of European jewelry dating back to World War II, when Shanghai was an open city providing safe haven for thousands of Jewish refugees. The jewelry, identifed as having belonged to one such refugee - Rosalie Gilder - was immediately stolen by a Chinese official who fled to New York City. Hired by a lawyer specializing in the recovery of Holocaust assets, Chin and Pilarsky are to find any and all leads to the missing jewels.However, Lydia soon learns that there is much more to the story than they've been told: The Shanghai Moon, one of the world's most sought after missing jewels, reputed to be worth millions, is believed to have been part of the same stash. Before Lydia can act on this new information, two men are murdered, Lydia is fired from the case, and Bill Smith finally reappears on the scene. Now Lydia and Bill must unravel the truth about the Shanghai Moon and the events that surrounded its disappearance sixty years ago during the chaos of war and revolution, if they are to stop more killings and uncover the truth of what is going on today. When the book was released in 2009, Maureen Corrigan in The Washington Post called it an "ambitious and absorbing riff on the classic Nancy Drew mystery", and said that THE SHANGHAI MOON demonstrated that "there's plenty of possibility lurking in the old missing-gems plot. It just takes a master like S.J. Rozan to restore the luster of a classic". It certainly sounds intriguing. I'm not sure if Rozan will win many or any of the three awards - THE SHANGHAI MOON would have to be a truly exceptional book to beat out John Hart's exquisite Edgar and Dagger Award-winning THE LAST CHILD for the Barry and Anthony Best Novel Awards - but you never know with these things, and regardless of eventual results, Rozan certainly deserves hearty congratulations as the 'consensus finalist', and someone who has a claim on having the most lauded book at Bouchercon. You can see the full list of finalists for the Macavity Awards here, the Barry Awards here, and the Anthony Awards here. Have you read THE SHANGHAI MOON? If so, what did you think? If not, do you like the sound of it? Which of the finalists do you think should win each award? Which have you read? Does winning an award matter, one way or the other? Thoughts and comments welcome. I've read it (UK Title is Trail of Blood). It's an absolutely charming book, very enjoyable, throwing light on an interesting period of history (Japanese invasion of China in WW2). In terms of winning an award - I suppose it depends whether it's like to give that much of a marketing edge to be the winner rather than on the shortlist - I wouldn't think it was as important for genre fiction, where afficionados would be interested in all the contenders, as for say a Booker prize winner. No, I haven't read _The Shanghai Moon_, but I have read one by her, _China Trade_. I thought it was a decent read, but I haven't read anything else by her. If one of the discussion groups wanted to select something by her, I wouldn't object. I think my lukewarm reaction may have been due to my increasing irritation at the number of detectives, victims, perps, authors, whathaveyou, who have suffered through child and are working their way through it in the novel. It's supposed to be a mystery novel, not a documentary on recovery programs. If I remember correctly, P.I. Bill Smith was an abused child, and P.I. Lydia Chin was an abused spouse who wouldn't break with her husband. Yes, I know things like this happen--I can read the headlines--but I'm getting a bit tired of having such issues pop up in every other mystery as an easy way to provide the "dark side" of existence and to appear "relevant." This is probably why I prefer the historicals, mysteries from the "Golden Age," and mysteries from outside the US border. That being said, it's been awhile  since I read her novel, so maybe she's worked her way out of that mode and is now focusing on writing mysteries. I understand what you're saying Fred, and things can get a bit 'samey' or cliched, but I quite enjoy it when the past plays a bit of a part in the mystery, both in terms of the plot and the protagonists, although this - as you say - can be overdone. I guess it's just whether it's done well or not. I discovered your blog only days ago and I am delighted to see your devotion. I'm very much into mysteries and thrillers myself, not only as an avid reader and book collector, but also as a book cover designer (check out www.jeroentenberge.com). Had planned to go to Bouchercon this year but like you I have to witness it from far away. Hopefully I'll be able to make it next year in St Louis! It's rather typical today that mysteries can only be solved by delving into the past. What's really tedious is that writers can't seem to come up with anything else but an abusive childhood as the explanation for the behavior for many of the characters in the story. I would LOVE to design covers for Kiwi crime, mystery and thriller writers! So far I've designed for American crime, mystery and thriller authors (more to follow soon). However exciting that is (and trust me - it really is! ), working for authors closer to home would be very welcome, if only for the chance to be able to meet each other in the flesh without having to first fly across the Pacific. Craig, can you email me directly? Cheers. I read THE SHANGHAI MOON and all I can say about it is: brilliant book. It deserves whatever awards it can win. S.J. Rozan is a very much under-appreciated author, though she has won an Edgar. I rarely post about my own work but: first, thanks, Craig, for the consensus congrats. I loved being nominated for them (and by now we know I won none). But more important: Fred, you're entitled not to like my books but you're remembering wrong. Bill Smith grew up with a violent father who smacked him around from time to time but he was NOT an abused child. And Lydia Chin's never been married. In fact the very idea of Lydia not leaving an abusive spouse is to laugh. She'd have clobbered the bum and taken the car. You've got someone else's books in mind and I'd hate for readers here to avoid my books because of what you said. Thanks for the comment SJ. I enjoyed the short story collecton you edited recently, and am definitely going to give some of your novels a go, after all the positive recommendations I've seen (not just on this website, but elsewhere). My apologies. I obviously confused your pair of P. I.s with another pair. If it's any consolation, I found Chin and Smith memorable while I have forgotten the other pair.